The phoenix (Ancient Greek: Φοῖνιξ, phoínix) is a mythical firebird which dies in flames and is reborn from the ashes. 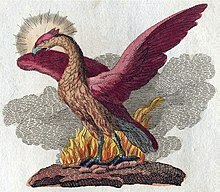 Scholars have observed analogues to the phoenix in a variety of cultures, including the Hindu Garuda and Gandaberunda, the Russian firebird, the Persian anka| and simorgh, the Turkish kerkes, the Tibetan Me byi karmo, the Chinese fenghuang, and the Japanese ho-oh. The scourge of England and the boast of France! A virgin phoenix from her ashes risen. Exhales her odours, blazes, and expires. and I will multiply days as the phoenix. (Hebrew: chol). You forget, fuzzy elf … I'm Phoenix. If I die it's only to be reborn — hopefully better and brighter than before. The facts in my head, they're so jumbled up … I don't know anymore what's real and what isn't — what actually happened … what's a lie. But it doesn't matter. Because the clutter doesn't affect my emotional realities — perhaps, in turn, because the Phoenix by nature responds better to feelings than rationality. I know who I am — who I care for, who I don't — that's what matters. The rest I can take or leave. There is another holy bird, called the Phoenix, which I have never seen but in pictures. He rarely appears in Egypt — only once in every 500 years, so they say, in Heliopolis — and he is supposed to come when his father dies. If the painter describes him truly, his plumage is part golden and part red, and he is very like an eagle in shape and size. They say that this bird comes from Arabia, bringing the body of his father embalmed in myrrh to the temple of the sun, and there he buries him. First he molds an egg of myrrh; then he puts his father in the middle of it. Lastly, he covers up the body with myrrh. This is what they say this bird does. But I do not believe them. Traced under trees by the eldritch light of sundown. Wake in her warm nest of renaissance. My mom was a phoenix who always expected to rise again from the ashes of her latest disaster. And in spite of her self-doubts, she had a very strong sense of who she was. She had a sense of self-worth. She loved being Judy Garland. Did she secretly long to be Frances Gumm Somebody, Minnesota housewife? Are you kidding? She'd have run off with a vaudeville troupe just the way my grandfather did. Most beings spring from other individuals; but there is a certain kind which reproduces itself. The Assyrians call it the Phoenix. It does not live on fruit or flowers, but on frankincense and odoriferous gums. When it has lived five hundred years, it builds itself a nest in the branches of an oak, or on the top of a palm tree. In this it collects cinnamon, and spikenard, and myrrh, and of these materials builds a pile on which it deposits itself, and dying, breathes out its last breath amidst odors. From the body of the parent bird a young Phoenix issues forth, destined to live a life as long as its predecessor. When this has grown up and gathered sufficient strength, it lifts its nest from the tree (its own cradle and its parent’s sepulcher), and carries it to the city of Heliopolis in Egypt, and deposits it in the temple of the Sun. "I used to watch them as a kid. My granny told me about 'em. Some cold nights you see them dancin' in the sky over the Hub, burnin' green and gold..."
"Oh, you mean the aurora coriolis," said Oats, trying to make his voice sound matter of fact. "But actually that's caused by magic particles hitting the-"
"Dunno what it's caused by," said Granny sharply, "but what it is is the phoenix dancin'." This page was last edited on 20 December 2018, at 16:08.